The second edition of the Atlas Motorcycle Ride, an initiative involving a number of motorbikes riding in aid of Pink October, was organised last Sunday, 2nd of October. 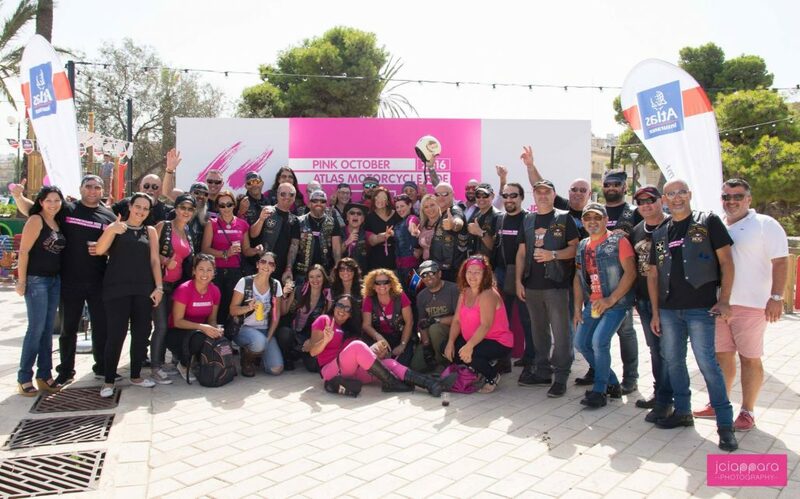 The event involved a fleet of motorbikes of every make and model riding across the Maltese roads, all with some pink symbol – an innovative method specifically aimed at raising funds for the Pink October foundation. All proceedings went towards facilitating the research processes of finding better treatment for breast cancer, as well as raising awareness about the disease itself. Motorbikes left Golden Bay at 8.30 a.m and drove towards the Atlas offices in the Ta’ Xbiex marina, where motorbikes where exhibited. the participation of KTM and Harley-Davidson® was inevitable, with a number of riders wearing pink or Pink October t-shirts. During the event, St. James distributed mammogram vouchers at a reduced price; Fapi Motors also did their part by donating a €200 euro voucher worth of showroom accessories to give out during the event. Fapi Motors’ participation in this event shows just how much the company recognises the need to raise awareness about the type of lifestyle a person is leading and encourages the fact that regular medical check-ups are a necessity. Fapi Motors are the official distributors of the KTM and Harley-Davidson® Brands. For more information send an e-mail to info@FapiMotors.com.mt or visit our showroom in Mdina Road, Attard.